Electric and hybrid vehicles will be conquering the cities: cars, bicycles, buses and trains. This is why new ideas are in demand for individual and public transportation. In “Fraunhofer’s System Research for Electromobility” researchers are coming up with solutions for tomorrow’s mobility. 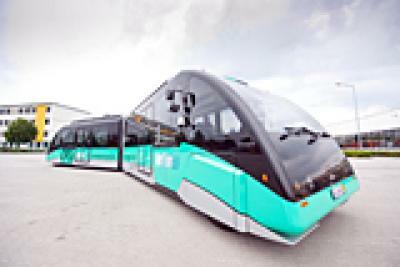 The AutoTram® is as long as a streetcar and as maneuverable as a bus. It doesn’t need rails or overhead lines because the “BusBahn” rolls on rubber tires and simply follows white lines on the street. Another plus is the fact that people waiting at stops will not have to smell exhaust fumes in the future when a bus stops and starts again because tomorrow’s means of transport will be using electricity, hydrogen or a combination of various regenerative drives. In “Fraunhofer’s System Research for Electromobility” the AutoTram® was used as an experimental platform. It was a component of the research collaboration of more than 30 Fraunhofer institutes. Dr. Ulrich Potthoff is the department head at the Fraunhofer Institute for Transportation and Infrastructure Systems IVI in Dresden, Germany, and this is how he sees it: “We provide functioning solutions for advancing electromobility in Germany. We use these two demonstrator vehicles — AutoTram® and a passenger car — to demonstrate that the recently developed components function interactively.” The German Federal Ministry of Education and Research has promoted this project with 34.5 million euros from its Economic Policy Program II for a period of two years while Economic Policy Program I invested another 14 million euros. The research topics in this group project were vehicle designs, power generation/distribution/conversion, energy storage engineering, technical system integration, reliability, testing and launch as well as social issues. The first designs of the AutoTram® were built a couple of years ago at the Fraunhofer Institute for Transportation and Infrastructure Systems. Dr. Matthias Klingner has been the director of the institute for six years: “This vehicle provided the ideal platform for our colleagues and us to test new developments not just as a simulation, but also in action.” New modules installed in the vehicle such as an energy storage device, double layer capacitors and clutches can show what they do in real-life practice. Potthoff adds, “We have set ourselves the task of testing all of the components interactively. We can use simulations to accelerate developments, but we can only be sure that it functions if the components and systems have stood up to hands-on testing. We fit the modules into the overall system of the AutoTram® at the Fraunhofer IVI Institute, and then we configure the interfaces.” For the scientist, the key is getting several institutes to collaborate: “It was fantastic to work with our colleagues because together we are more than the sum of the individual institutes. A case in point is the lithium-ion battery system we built into electrical vehicles last week. Eleven Fraunhofer institutes each added their specific expertise to the project.” Incidentally, these packs can also be used for passenger cars. The battery system consists of a whole series of cells and they do not always discharge at the same speed. The entire battery can suffer if individual ones fail or no longer provide the planned output. This is the reason why these packs are controlled by a higher-level energy management system. Dr. Matthias Vetter is from the Fraunhofer Institute for Solar Energy Systems ISE in Freiburg, Germany. As project director for coordinating the project, he describes the basic principle: “The electronic system measures the current, single-cell voltage and temperature in fractions of a second for calculating the charging and aging state. This is how we can find out whether each cell is about to overcharge, undercharge, overheat or age prematurely.” Unlike cars that park an average of 23 hours a day, buses and trains are on the road the whole day so there isn’t much time to charge batteries. A potential solution is fast-charging stations at bus stops in combination with dual storage units in the vehicle itself. The tram taps the quantity of energy it needs to make it to the next stop or the stop after that in only 20-30 seconds During this time passengers are getting in and out. Barz is a scientist at the Fraunhofer Institute for Transportation and Infrastructure Systems. As he puts it: “We are working on the modules needed such as the energy storage device, high-performance converters and contact systems for transmitting the current. In contrast to batteries, our supercapacitors have a high level of power density and they make sure that the charge can be stored quickly.” When the tram stops, the silvery current collector on the roof moves upward and docks onto the source of electricity. Then small but strong electromagnets turn on. They generate enough power to press the contacts together enormously. This is where the resistance (and therefore heat development) is lower when high levels of energy of more than 1,000 amperes and 700 volts are transmitted. But where does the needed electricity come from? There is an energy storage device at the tram stop, and it slowly collects small amounts of electricity to avoid load peaks for the power generator wherever possible. As Barz says: “We adapt the number of charging stations to the specific route. The number of stations needed depends on the shape of the route, whether it goes up or down and how long it takes to the next tram stop.” In any event, there is a diesel engine for emergencies — in other words, if the next current charging station is too far away. Potthoff vividly elucidates the principles behind super capacitors: “Batteries take a certain amount of time to charge. You can compare that with a large bathtub and a small supply. On the other hand, capacitors absorb the charge very quickly like a small bathtub and a large supply. Unfortunately, they can only store a small amount of energy.” The engineers are working at linking the battery system and capacitors in urban transportation for this application. Potthoff continues: “We are coming up with dual storage units and also testing combinations with other storage models and fuel cells.” His colleagues at the Fraunhofer Institute for Integrated Systems and Device Technology IISB are contributing new developments in high-performance electronic components such as a DC converter that adapts the voltage level. These specially built DC/DC converters are needed to couple the double-layer capacitors with the drive train. However, the materials that stand up to high power conversion are also of pivotal importance. The surface of these contacts has to be very sturdy and resistant to wear. This is where the researchers from the Fraunhofer Institute for Material and Beam Technology IWS come in — they have developed the materials needed and the way they are processed.